Christmas weekend is here, bringing five new wide releases to a suddenly busy marketplace, with two more slated for Christmas Day proper. Welcome to the Twelve Days of Box Office, folks. As I mentioned last week, here's another reminder that box office for the next week and a half is all about the long haul, not just this weekend. With schools out and many other places giving vacation days for the holidays, people suddenly have a lot of time on their hands and traditionally use that to see movies in theaters. While Star Wars ruined everything for the last three years, don't dismiss any of these films (okay, except one) as disappointments until we're looking at their totals 10 days from now. There will be a Monday dip as Christmas Eve works against this notion, but expect everything to explode on Tuesday and for the remainder of the week. The last time we saw 2018's calendar configuration was 2007, when five movies also opened over the pre-Christmas weekend, led by National Treasure: Book of Secrets, which opened with $44.7 million but had $142.9 million by New Year's Day. Also out that weekend was Charlie Wilson's War, which spun a $9.6 million opening into a respectable $66 million total. Een future cult classic Walk Hard placed ninth with $4.1 million yet finished with $18.3 million. As we're fond of saying here, the high tide rises all boats. 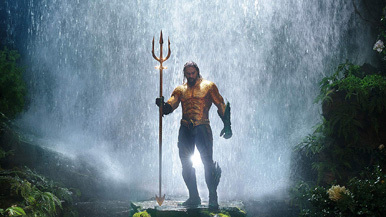 The top film for the weekend is, of course, Aquaman - something we all saw coming a few years ago when the superhero movie craze started. Earning a solid $67.4 million for the weekend, that's the ninth best opening weekend in December. Add in a gimmicky one night pre-screening for Amazon Prime members last week, which wasn't reported in last week's numbers but is counted as a separate day's box office anyway, and it's got $72.1 million. At the risk of stealing Reagen Sulewski's bit, imagine going back in time ten years and telling them that an Aquaman movie would be a hit but nobody's made a good Batman or Superman movie since then. This is a very strong start for the film that's going to easily win the holiday season, again something that we all declared would happen when Jason Momoa first appeared in Batman vs. Superman. DC film adaptations have been a surprisingly tough sell even though the property has the two most recognizable superhero names. That's been mainly due to quality issues, of course; after Dawn of Justice's $330.3 million and the villain-centric Suicide Squad adding $325.1 million in 2016, diminishing returns kicked in quickly, with their version of the Avengers, Justice League, earning just $229 million, which immediately took the shine off the one they got right, Wonder Woman, which made $412.5 million. While Batman, Superman and the mashups appear to be lost causes, after the success of Wonder Woman, hope for the DC Extended Universe quickly turned to the other standalone films planned for the future. A Christmas release seemed like a gutsy call, but Warner Bros. was smart in taking advantage of the temporary hole left by Star Wars, which chose to release the Solo spin-off over Memorial Day, a move that did not pay off. Reviews were kinda in the middle, but leaned positive (64% Fresh) as consensus said it was good, dumb fun, and that's what the DC films needed. The opening weekend will be more than enough to get Aquaman to the $200 million mark by the time we turn the calendar over to 2019. From there, we'll see how well it holds up once the holidays are by us. After three days, it's tough to tell if it will end up being the second most successful DC film, but this is a strong enough start that it will have a solid Christmas week of box office. We will certainly know more next weekend. Second place goes to Mary Poppins Returns, a sequel to the original, 54 years later. Starring Emily Blunt and Lin-Manuel Miranda, the Disney musical started with $22.2 million. As probably the most likely choice for families over the next week, this is a fine start. While I don't expect The Greatest Showman-like legs from this one, it's still in a good place. Buoyed, perhaps, by four Golden Globe nominations and considered a dark horse for a Best Picture nomination (as well as an acting nomination for Blunt), it's easily going to top its $130 million budget. While not to the level of Aquaman, I expect solid overseas numbers as well. Another opener is close behind in third place as Bumblebee earns $21 million. A Transformers spin-off doesn't seem like a good idea on paper after what Michael Bay did to the franchise, but somehow this one landed at 94% Fresh at Rotten Tomatoes (perhaps benefiting from lowered expectations) and did something right by going back in time to the 80s and tapping a vein of nostalgia. It's perhaps a bit of a slower start than expected (and likely audiences need to be sold on the concept again after largely rejecting 2017's The Last Knight, which cut the box office of 2014's Trans4mers by nearly half), but the theme for the holiday box office season is that it's a marathon, not a sprint. Audiences have given it a CinemaScore of A-, so they're buying what the film is selling, and that will bode well for its prospects in the next week and potentially beyond. Spider-Man: Into the Spider-verse drops 53% from last weekend to $16.7 million and has $64.8 million after two weekends. The drop isn't too alarming; it was to be expected after a deluge of new releases. The key thing to watch here is actually next weekend. With the "gotta see it right away" contingent out of the way, the drop from this weekend to next weekend actually has a chance to be negligible. That's the sort of thing that will send a film's box office into the stratosphere. It's already going to have a good week of earnings, and I'd actually expect it to be around $100 million after next weekend, especially with the incredible word of mouth it's getting.